Catholic Action called for one million Rosaries to be given on Saturday 10/13/01, fulfilling Our Lady's request at Fatima for world peace and the triumph of her Immaculate Heart. That is an excellent solution to today's problems. 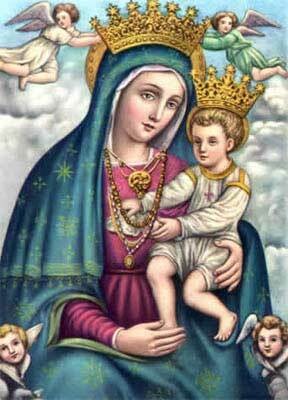 Doing the Rosary is so simple a solution yet it may be beyond the understanding of many. "The way to understand and work with God's plan is through prayer and meditation, through prayer to call to God, and through meditation to receive His message and His inspiration." "I was told that the world could be saved, not by its leaders, but by prayer groups throughout the world. I was told that the prayers of a group of twenty could save a nation from war. I was told that the fate of mankind rested on our ability, individually and collectively, to change the direction of mankind in accordance with God's plan." Mr. Dougherty traveled to the Coptic Church in Zeitoun, Egypt at the request of The Blessed Virgin. 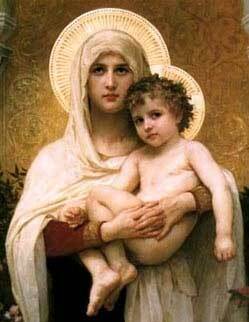 When he saw this picture inside the Church, he was amazed for that is the way she appeared to him. Hail, Holy Queen: The Mother of God in the Word of God by Scott Hahn; from Amazon: Hail, Holy Queen: The Mother of God in the Word of God is theologian Scott Hahn's follow-up to his bestselling The Lamb's Supper. Like the previous book, Hail, Holy Queen melds autobiographical reflections, scriptural interpretation, and historical anecdotes in an accessible style to clarify some sophisticated points of Catholic theology. Mary Through the Centuries: Her Place in the History of Culture by Jaroslav Pelikan; Amazon: A sequel to Jesus Through the Centuries, this scholarly study of Christ's mother Mary by Jaroslav Pelikan, a Yale historian of Christian theology, is thoroughly grounded in formal theology yet still explores the many manifestations of Marian devotion that have emerged in the wider culture. These manifestations include images from art, music, and literature, from Mary's Immaculate Conception to her bodily Assumption into Heaven. Mary, Mother of Jesus by Bruce E. Dana; editor review: This unique book takes the scriptures and words of respected scholars to give readers a glimpse into Mary's everyday life in the Jewish culture. 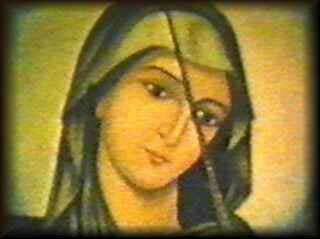 We also learn how she developed her spiritual attributes and her true relationship with our Father in Heaven. God-Sent : A History of the Accredited Apparitions of Mary by Roy Abraham Varghese; From Booklist: Varghese furnishes a comprehensive overview of all the accredited apparitions of the Virgin Mary through the ages. Although there have been more than 20,000 reported Marian sightings throughout history, the author confines himself to analyzing the 67 mystical appearances that have been investigated and validated by contemporary ecclesiastical and, in some cases, civil authorities. The Last Secret by Michael H. Brown; Ingram Review: New from the bestselling author of "The Final Hour" comes "The Last Secret", in which Michael Brown takes a look at the apparitions of the Virgin Mary as she has appeared throughout church history. A comprehensive volume that systematically reveals what she has been saying to us, this title shows how those messages apply to life today . Medjugorje: The Message by Wayne Weible, Svetozar Kraljevic; A reviewer at Amazon: Reading Medjugorje:The Message is a truly uplifting experience. Wayne Weible describes the remarkable events of Medjugorje in such a vivid way that the reader clearly hears the message of the Blessed Mother. If you read this book with a mind and heart open to God, it can really change your life. The Essential Mary Handbook: A Summary of Beliefs, Practices, and Prayers (Redemptorist Pastoral Publication) by Judith A. Bauer (Editor)Reviewr at Amazon: If you are looking for a comprehensive book of Marian prayers and devotions this book is for you. A blend of ancient and modern this book is one I keep at my nightstand. If you take Vatican II seriously when it asked for a true renewal of devotion to Mary you will find this book very useful. It also contains some lesser known prayers and devotions that deserve greater circulation. Marian Shrines of the United States: A Pilgrim's Travel Guide by Theresa Santa Czarnopys, Thomas M. Santa; editor review: Marian Shrines of the United States takes you on a pilgrimage to more than 50 of the most celebrated U.S. Marian shrines and sanctuaries. More than just a travel guide, this reference is a must-read for Marian enthusiasts of all kinds, including those who wish to enjoy a special pilgrimage without ever leaving home. My Soul Doth Magnify the Lord! 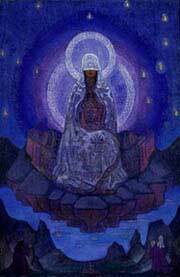 Mother Mary's New Age Teachings and Rosary; by Mark L. Prophet and Elizabeth Clare Prophet. From the publisher: In her many appearances throughout the world, Mother Mary has stressed that prayer and the recitation of the rosary are keys to lasting world peace. This book introduces a nondenominational rosary that can be given by people of all faiths along with messages from Mary. Includes beautiful renderings of the Madonna by Renaissance masters. Miracles of Mary: Apparitions, Legends, and Miraculous Works of the Blessed Virgin Mary by Michael S. Durham; From Booklist: Durham has gathered an impressive variety of images of Mary, together with stories of her appearances from the first century to the present, that will appeal to a broad audience at a time of widespread interest in and practice of Marian devotion. Durham's style is popular, and the book is readily accessible. Encountering Mary: Visions of Mary from LA Salette to Medjugorie by Sandra L. Zimdars-Swartz; from Ingram: Over the past two centuries, hundreds of apparitions of the Virgin Mary have been reported, drawing crowds to the seers and the sites, and constituting events of great religious significance. Zimdars-Swartz provides an intriguing exploration of the experiences and interpretations of seven apparitions. The Miracle Detective : An Investigation of Holy Visions by Randall Sullivan; From Publishers Weekly: In what often reads like a spiritual whodunit, author and Rolling Stone contributing editor Sullivan takes readers on a journey into the labyrinthine world of religious apparitions and miracle investigations. Sullivan's fascination with the subject began in 1994 when he learned of a spiritual phenomenon in his own backyardthe reported apparition of the Virgin Mary in a rundown trailer in eastern Oregon. Intrigued, he did some cursory research about such occurrences and proposed to his publisher to do a book on "miracle detectives." He began in Rome, where he met with Catholic Church officials charged with investigating such phenomena, and proceeded to the village of Medjugorje ... The Day Will Come; Mystics, Prophecies and Miracles by Michael H. Brown; Amazon Reviewer: This book was an excellent compendium of both multifarious mystical phenomena and the ways in which we can verify their certitude of falsehood. Especially compelling is the evidence listed on Medjugorje and its visionaries; for instance, extensive medical testing of said visionaries have found no duplicity--in fact, there has been no medical, scientific or psychological explanation for why these children, all six of them together, were able to follow apparitions of the Blessed Virgin Mary with their eyes simultaneously and synchronously as being observed by scientific experts, where to them the kids were merely staring at a blank wall. New: The Mystical City of God: Life of the Virgin Mother of God, manifested to Sister Mary of Jesus of Agreda, 1602-1666; Editor: Apparently, Mary of Agreda received the story of Mother Mary's life twice direct from the source. The first time she destroyed the manuscript being scared by a priest. The Blessed Virgin came back and she rewrote it. Concerning the Passing Of the Blessed Virgin Mary-8\31 The description of Mother Mary's Ascension or Assumption, attributed to Joseph of Arimathea.